I thought I would chip in with some feedback on the Danish lists, since I'm a Dane myself, and a military historian formerly employed at the Danish Arsenal Museum. In my group, we'd like to help out by playtesting Danish vs. Soviet lists when we get around to it. For starters, here are some small things I noticed in the list. The Danish army never used the MG42. They use the MG3 designated M/62 from 1962 on, just like you put in the text. Any MG before that would probably be the SIG 50, Madsen M/48 or the M/37s Swedish BAR. The A-10 is not in service in the Danish Air Force. It might be supposed to represent US allies, but with the option to roll on the US air support list, I thought I would mention it. Thanks for having a look at my Danish Army list and I look forward to hearing how you get on when you can get in a game or too. Very happy to have feedback from a Danish military historian - someone to set me straight finally! Cheeselt wrote: The Danish army never used the MG42. They use the MG3 designated M/62 from 1962 on, just like you put in the text. Any MG before that would probably be the SIG 50, Madsen M/48 or the M/37s Swedish BAR. I'll be the first to admit I had to make some calculated guesses regarding some of the equipment a "second-rate" infantry unit might have. I had read that the Danes were still using M1 Garands and other surplus WW2 equipment even into the 1980s - and I also read that the Home Guard had some surplus WW2 German MG-42. So I made a guess that reservists might be similarly equipped. Which MG do you suggest I use - or just stick with the M/62? Same with the BAR in the Home Guard units. I assumed they were ex-US army war stock. Are you suggesting they should be M/37's? Thanks - definitely not meant to imply A-10's were in the Danish Air Force! Happy to change that - possibly to the F-104G - which I go easily argue (in my head) was not retired due to the possibility of hostilities breaking out. Sorry it took so long to reply, but I have found some information about squad weapons from a reliable source. All of the "correct" equipment will be very dependent on the year selected as the definite "BG: Northag" year. But the army only purchases about 400 of these, so the ubiquitous LMG will still be the Madsen, albeit in a new variant: M/48. The M/51 has a relatively high rate of fire, of 8-900 rounds per minute, so it would probably be close to the performance of the M/62. In 1962, all Madsen and Neuhausen LMG's are replaced by the M/62, so there should probably not be an option for any other LMG in the regular army. In the Home Guard (HJV is the abbreviation used in Denmark), the Madsen is still in widespread use until well into the 1980's. Rules-wise, the Bren and Madsen should probably have more or less the same characteristics, whereas the M/51 and the M/62 should be close to each other. Unfortunately, the Garand had been more or less replaced by the M/75 rifle even in Home Guard use by the 80's. But to make matters complicated, the Life Guards conscripts actually used their ceremonial Garands as their battle rifle until the 90's, so that would probably be a more probable place to see the old Garands. I'll happily find out which tanks and planes were in use when the year has been determined. Also, I have a picture of the Life Guards conscripts on their annual big exercise where they are using Garands and pedal bikes! I can also get you loads of reference pics of Danish troops from the era, if you need them. Looks like I'm going to have to scrap my painted HJV platoon - armed with Garands, BARs and MG-42!!!! I wish I'd know you before finishing that unit off!!!! So it looks like I should have Infantry and HJV platoons where the NCOs is armed with a Hovea M/49 or M/66, where the GPMG is a M62 and everyone else has a M/66. In HJV units I could have a Bren or Madsen LMG as an optional extra? Or could I change the Infantry Platoon to Life Guards Platoon and keep the Garands in place of M/66s? I assume they would have deployed only on Zeeland? Sorry about that! But you can at least leave the MG42's since they look identical to M/62's. All officers should be equipped with M/49 and all infantrymen should be armed with M/75. You should probably have M/62 be standard MG in all regular formations, but have the HJV come equipped with a Madsen M/48 and give them M/62 as an upgrade option. If you want to make Life Guards available, I suggest you make Garand M/50 their standard rifle. The M/66 is the sniper variant of the G3, so only dedicated snipers should use that. The M/75 is the standard version, used by both the Home Guard and regular formations. Minor spelling note: Home Guard is 'Hjemmeværnet' in Danish. You've only spelled it with one 'm'. Things I'm looking into now: Were NCO's equipped with M/75 or M/49. Should the M/75 be an upgrade for Life Guards (if you decide to implement them) or were they only ever equipped with M/50 Garand? Let me know if you want some more info about the Danish Cold War military organisation, units, equipment etc. I know a couple unemployed military historians who specialise in the Cold War era. Edit: It's correct that NCO's were equipped with the M/49 SMG too. Also, an upgrade to M/75 rifles could be available for Life Guards too, as it was only the conscripts that used Garands. Please let me know what you and your colleagues think. I've sent the pics on to my friend to check over (btw. he's not a war gamer but has expressed interest in trying out these rules) to see if the support options are correct. Would you be interested in more knowledge about the different units like the Life Guards? The Dragoons would be attached to Landjut iirc and would probably have some other, specialised equipment options. Ok, I seem to have forgotten to write down the feedback I got from my friend, but it has been a busy couple of weeks at work. He says it looks quite sensible now, although the recoilless rifle should probably only be for Hjemmeværnet. Other than that, LG is good to go! Great work and very exciting project! I too have a background in the Danish Armed Forces – and a degree in military science and history. My background is mainly Home Guard and Life Guard. A tricky subject is how Danish Home Guard units should be treated in game. Are they regular, but less trained infantry? Are they any good in combat? Even PACT intelligence had big problems evaluating Home Guard units – they did not really know what to expect. Hjemmeværns equipment and organization is as others have pointed out very dependent on timeframe. From 1960 and forward the tactical doctrine and role of Hjemmeværnet was defined by what “phase” was declared. A phase was a sort of tactical mode that could be declared by regional or local command dependent on the situation. 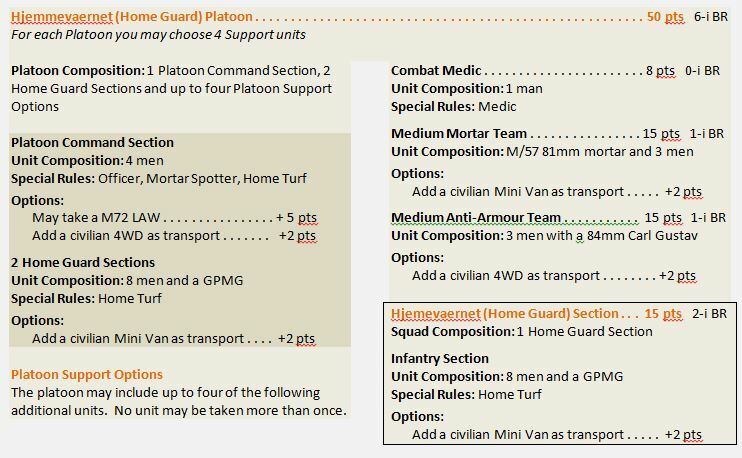 A home guard unit would have different tasks, priorities and command-and-control layout for each phase. We had 5 phases, Guard Phase, Bridgehead Phase, Defense Phase, Guerilla and withdrawal Phase and Advancing Phase. In the Guard Phase, Home Guard Units would guard critical civil and military infrastructure against saboteurs. Objects where graded to either requiring a squad, a platoon or a whole company. Bridgehead Phase was the identification, observation and spoiling attracts against enemy beach and air landings. Defense Phase was the phase where road would be defended, bridges blown and use of prepared defenses was used. Guerilla and withdrawal Phase has two names depending on if the home guard unit finds itself behind enemy lines or not. Guerilla operations against rear arear PACT forces was a central part of Hjemmeværns doctrine and training. Small squads of 10 men with light weapons and explosives was to conduct hit-and-run attacks throughout the enemy rear. Using their local knowledge, extensive planning and by never staying for a full fight, it was hoped they would slow down PACT combat tempo. Now how can we translate this into BG? CheeseIt wrote: He says it looks quite sensible now, although the recoilless rifle should probably only be for Hjemmeværnet. Other than that, LG is good to go! Thanks for that. If I remove the recoilless rifle from the Life Guards they will be without any anti-tank capabilities. Do you suggest I change it for a Carl Gustav team like in the HJV platoon? Thanks for having a look at the list and for your very interesting comments on the HJV. Really useful stuff. 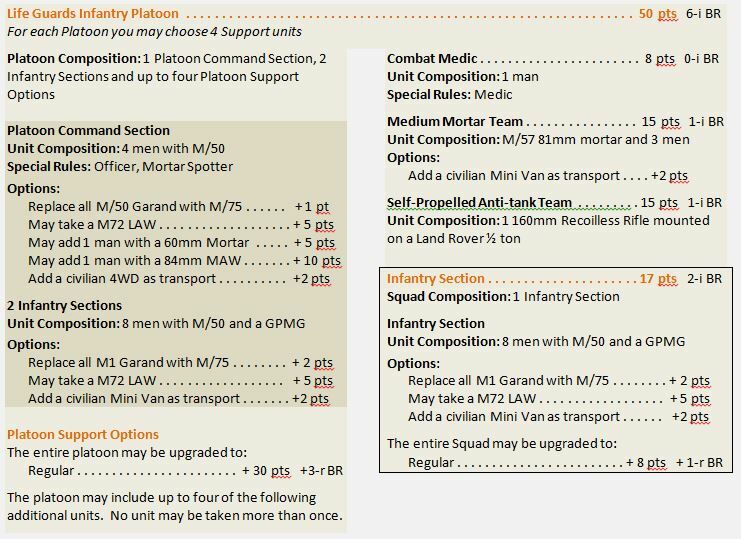 Based on what you've written I've added "Behind Enemy Lines" as a +5 point option for the HJV Platoon Command, each section and the MAW Team. This would allow the player the option of playing them as either straight infantry or a guerilla force. In the recon section of the list there is a small 8 man HJV Special Intelligence patrol that comes with demo charges. This is classed as a veteran unit but could easily represent what you are talking about. I need to decide on a couple of things though. Should I add the recoilless rifle mounted on a land rover to the HJV platoon or maybe as another HJV recon option? I also have to settle on exactly what the "Home Turf" special rules is for the HJV units in the list that have it. I have used it in other games (typically for local police units) to allow them to auto pass their first morale test. I'm not sure if this is what I want for the HJV. I see the HJV as having expert local knowledge on the terrain, lesser known routes etc and believe they would use this local knowledge to their best advantage during a conflict. Something like the old Ambush Alley rule allowing the HJV to move anywhere on the board (between hot spots) as long as it was out of sight of the enemy would be pretty cool - but would be a big shift int he game and probably not that sensible except in small HJV only scenarios. Anyway - just waffling now - but I'd be happy to consider any suggestions. Yes, the Carl Gustav would be used as the standard AT weapon for infantry units in the Danish Army, correctly supplemented by the older LAW as you already give options for in the list. Life Guards should also have access to TOW armed Land Rovers. That sounds like a good way to handle it. The HJV Special Intelligence patrols (Two company sized units, operating 4-man patrols: SEP/ ELK for LANDZEALAND and SEP / VLK for LANDJUT) where Korps-level elite stay behind recon units. They were “produced” by the Home Guard, but would fight as part of the regular army. It’s very cool that they are in the game. Nope, I don’t think Home Guard units used any recoilless rifle mounted on anything. In the 70-80’s, generally a standard company didn’t even have full transport attached – civilian vans would be used. The Carl Gustav where the standard anti-tank weapon with 1 in each squad. I think “Home Turf” gives an extra 1D6 BR? I see the HJV as having expert local knowledge on the terrain, lesser known routes etc and believe they would use this local knowledge to their best advantage during a conflict. Something like the old Ambush Alley rule allowing the HJV to move anywhere on the board (between hot spots) as long as it was out of sight of the enemy would be pretty cool - but would be a big shift in he game and probably not that sensible except in small HJV only scenarios. I agree with you that Ambush Alley would be too big of an issue because of game balance, but you are right about using local knowledge. Besides special staff units, pioneer units and various semi-elite patrol units all Home Guard units where “Area Companies”. In a war, they was not meant to be used outside their home area – the same area where the home guard soldiers lived. (That’s why it was called Home Guard) That meant that the soldiers would be training for and fighting in they own neighborhood. I feel that scout would also be to big of an advantage – even if it sort of fits thematically. Perhaps a “Local Knowledge” rule? 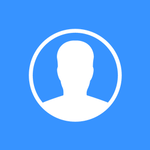 They are more difficult to spot, but are not better at spotting themselves? Another way to handle Home Guard action behind enemy lines would be as an general rule. +15 points “Hit-and-run attacks” Units behind the front are being slowed down by hit-and-run attacks. Units that arrives from reserves are delayed 1 round. + 10 points “Hidden Home Guard unit” Before the game write down a location (must be a building or a concealing terrain) on the map and a round. In that round, you may fire a single Carl Gustav shoot or two burst of MG from the location as if it was fired from a irregular unit. I just found another thing - mortars. Home Guard unis did not have any mortars from 1971 and forward. Som units may have had a few 2 inch mortars, but they where only used for star shells and smoke. KplRavn wrote: I need to decide on a couple of things though. Should I add the recoilless rifle mounted on a land rover to the HJV platoon or maybe as another HJV recon option? Thanks - won't go with that option. KplRavn wrote: I also have to settle on exactly what the "Home Turf" special rules is for the HJV units in the list that have it. I have used it in other games (typically for local police units) to allow them to auto pass their first morale test. I'm not sure if this is what I want for the HJV. KplRavn wrote: I feel that scout would also be to big of an advantage – even if it sort of fits thematically. Perhaps a “Local Knowledge” rule? They are more difficult to spot, but are not better at spotting themselves? Yeah Local knowledge and Home Turf are the same thing in my book. Just need to work out a good way to represent that on the tabletop. KplRavn wrote: Another way to handle Home Guard action behind enemy lines would be as an general rule. KplRavn wrote: I just found another thing - mortars. Home Guard unis did not have any mortars from 1971 and forward. Som units may have had a few 2 inch mortars, but they where only used for star shells and smoke. Great - thanks for letting me know. The medium mortar has now been deleted. I have a question regarding the list, which might stem from being unfamiliar with BG rules generally. The Mech. Platoon HQ section states it is composed of 6 men and a 60mm. mortar. It doesn't state how many of the 6 men are manning the mortar, or if the mortar crew is separate from the HQ section. Or is the entire section manning the mortar? Cheeselt wrote: I have a question regarding the list, which might stem from being unfamiliar with BG rules generally. The Mech. Platoon HQ section states it is composed of 6 men and a 60mm. mortar. It doesn't state how many of the 6 men are manning the mortar, or if the mortar crew is separate from the HQ section. Or is the entire section manning the mortar? The unit is all 6 men, two of which man the light mortar. In my mind the rest of the unit might be the Officer, Platoon NCO, Radio Operator and a runner. That doesn't really matter. They can be all armed with the same small arms or you might want to give some SMGs (which is what I've done for my light mortar team and platoon NCO). The unit has the fireteam special rule so the Danish player might decide to split off the 2 men with the mortar and create two new units - one of 4 men (with the officer) and the light mortar team of 2 men.